Jeepers creepers! 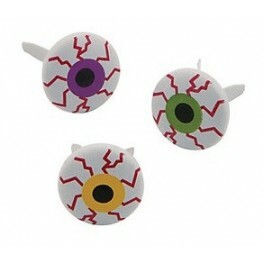 Whether you want creepy or kooky, you’ll love having these metal Eyeball brads in your craft supplies. 1/2" heads featuring irises in green, purple and yellow surrounded with red veins, give these brads the ideal look for any of your Halloween crafts or scrapbook pages. Sold in packs of 12 (Qty 1 = a pack of 12).